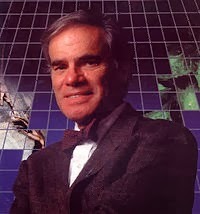 Martin Rodbell was born on December 1, 1925 in Baltimore, Maryland. He was the son of a grocer and attended public schools including an accelerated program and Baltimore City College. In 1943 he went to John Hopkins University where he studied biology and French existential literature. His studies at John Hopkins where interrupted by World War II, when he served in the U.S. Navy as a radio operator in the South Pacific. He graduated with his bachelors in 1949, spending his last year taking all the advanced chemistry courses offed by Hopkins. In 1950 he went to the University of Washington where he earned his doctorate under Donald Hanahan, completing a thesis on the metabolism of lecithin in the liver. Lecithin is a mixture of phospholipids that acts as a surfactant and lubricant. Rodbell did his postdoctoral work at the University of Illinois at Urbana-Champaign where he worked for two years as a research assistant. In 1956 he took a position as a research biochemist in the laboratory of in the laboratory of Christian Anfinsen at the National Heart Institute where he studied the composition of lipid proteins and the role of glucose in adipose tissue. In 1961 Rodbell transferred to the National Institute of Arthritis and Metabolic Disease (now part of the National Institute of Diabetes and Digestive and Kidney Diseases). The move also coincided with a change in the focus of his research moved away from studying phospholipids and began researching cellular second messenger systems. Second messengers are chemicals that are let into or produced inside a cell in response to an outside signal. The production or ingress of second messengers is stimulated by the reception of a chemical signal at a receptor protein embedded in the cellular membrane. Rodbell was researching the effects of glucagon on rat liver cells and discovered g-proteins, a series of inter-cellular proteins that are linked to cellular membrane embedded receptors which can activate transcription and protein production. These proteins are used throughout the endocrine system as a means of coupling the extra-cellular signal with internal cell activity. For his discoveries the g-proteins Rodbell shared the 1994 Nobel Prize in Physiology or Medicine with Alfred G. G. Gilman. Rodbell retired in 1994 and died on December 7, 1998 of multiple organ failure.